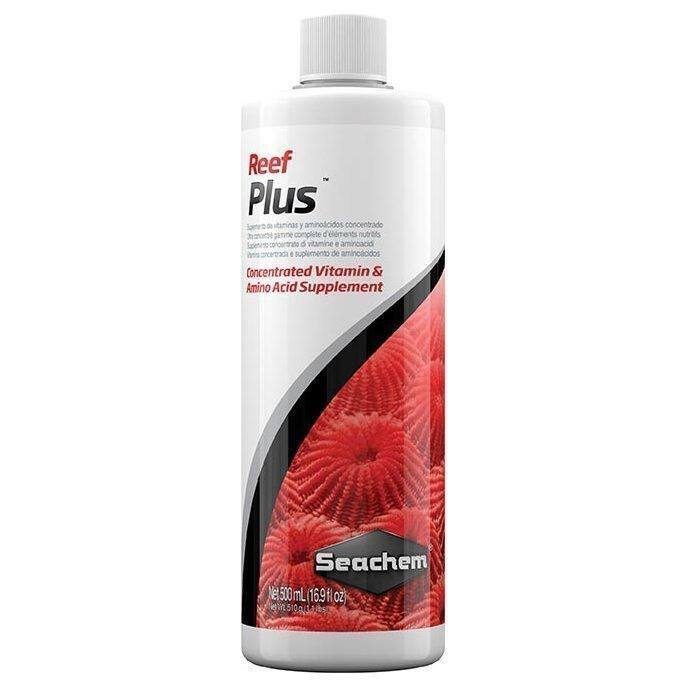 Seachem Reef Plus is a full spectrum reef supplement containing trace elements, vitamins, and amino acids demonstrated to have a positive impact on the growth of corals and other desirable reef creatures. 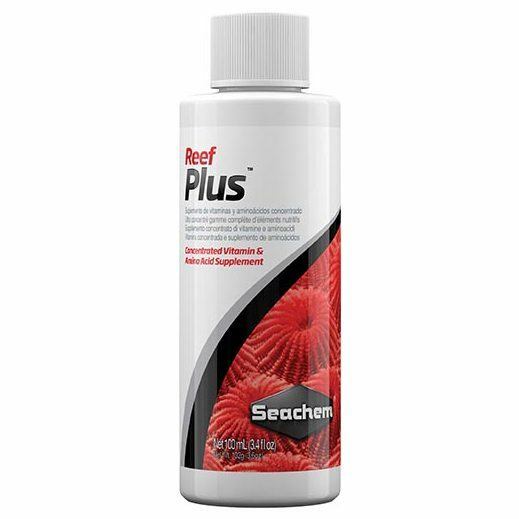 Seachem Reef Plus is formulated to provide nutrients available from natural tropical reef waters. Contains vitamin B12, vitamin C, thiamine, inositol, choline, iodide, and other essential constituents. Seachem Reef Plus is nitrate/phosphate free. Other manufacturers’ vitamin supplements are incomplete, containing only vitamins and trace minerals. 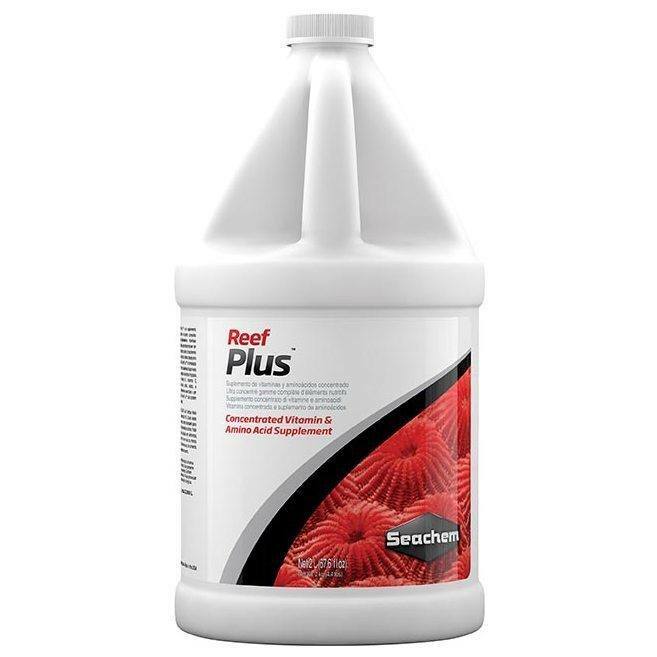 Reef Plus™ contains necessary amino acids in addition to a full complement of trace minerals and high amounts of vitamin C and B complex vitamins. It is so concentrated that it can be effectively used as a food soak for frozen fish foods. Replenishment of a number of trace elements is required to maintain an environment ideal for the growth and reproduction of marine life, but while the importance of trace elements has been recognized by aquarists for many years, the physiological reasons are not fully understood. The chemical elements in seawater are varied, and, likewise their addition to the aquarium in trace quantities has varied effects on a variety of saltwater plant and invertebrate species. In general, though, these elements are important for metabolic processes and pigment formation. Addition of iron, for instance, has been shown to benefit coloring and growth for corals, anemones, and other photosynthetic animals. Use 1 capful (5 mL) for each 80 L (20 US gallons) twice a week or as required to maintain coral growth. May also be used in food by mixing 1 mL in about 15 mL (1 tablespoon) of food. Refrigerate after opening.